Guys, Kids camp is my literal favorite. When Moose's company told him that he may be going to Ireland June 22, I said, "Well, I'll have to join you later because that's kids camp week." It's something we've done forever and ever and I Love It! Every year, as far back as I remember, my mom has been our Kids Minister. There was a season where she did preschool and her best friend did kids, but we still go to go to camp ;) For at least 15 years, we have taken a group of kids and adults to Hickory Knob State Park for a week of competition, fun, and Jesus. Camp has evolved over the years! We were reminiscing this year about year one with this current church (one of our helpers is a senior in high school this year--she's been every year since that one!). That first year we had Bible study and meals in a cabin living room. We fished with cane poles and had approximately 25 students. We've come a long way to 60 + kids, 20 + volunteers, a meeting room, feeding around 100 every day, Jet ski tubing, and team competitions. Another picture of my cabin and my fellow chaperon Rachel! I was so grateful for Rachel! Her being in our room allowed me to take care of media, help mom create games, and be mom's right hand woman. Normally, that is my whole job, but this year I juggled that with being a cabin mom! Our second "division" was our team. There were six teams and we competed in awesome games each day. We played capture the flag-kid style, water gun tag-with paint, twister-in colored shaving cream, road rally/scavenger hunt, and water balloons! 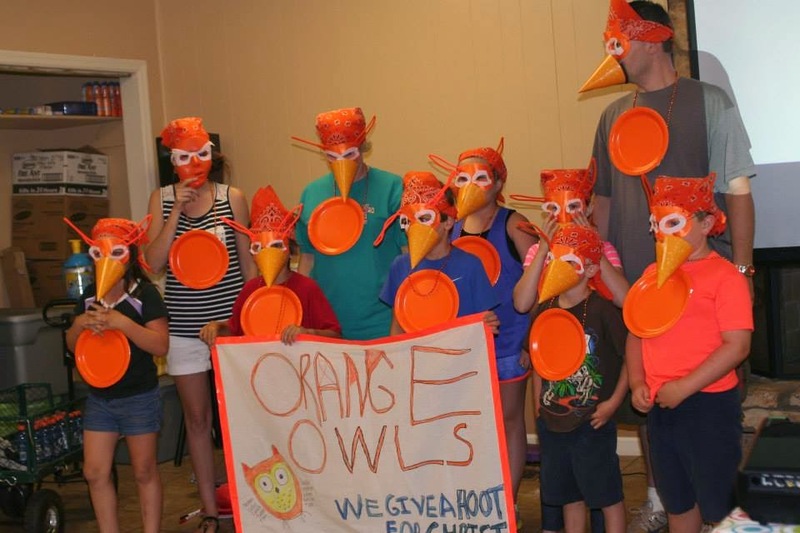 I'm proud to say my Orange Owls came out on top!!!! Most importantly, we spend time in the Word! We have corporate worship, filled with songs, games, fun videos, and teaching. It's so sweet to watch these kiddos worship Jesus in their own element! Click here to visit our facebook page and see all of our pictures and videos from camp. And for a super fun, but sort of lengthy video recap, go here.